Do anti-TNF agents have equal efficacy in patients with rheumatoid arthritis? Tumor necrosis factor (TNF) antagonists have dramatically improved the outcomes of rheumatoid arthritis (RA). Three agents currently available in the USA – infliximab, etanercept, and adalimumab – have been designed to modify the biologic effects of TNF. Infliximab and adalimumab are monoclonal antibodies, and etanercept is a soluble protein. The pharmacokinetic and pharmacodynamic properties of each differs significantly from those of the others. All three agents are effective and safe, and can improve the quality of life in patients with RA. Although no direct comparisons are available, clinical trials provide evidence that can be used to evaluate the comparative efficacy of these agents. Infliximab, in combination with methotrexate, has been shown to relieve the signs and symptoms of RA, decrease total joint score progression, prevent joint erosions and joint-space narrowing, and improve physical function for up to 2 years. Etanercept has been shown to relieve the signs and symptoms of RA, decrease total joint score progression, and slow the rate of joint destruction, and might improve physical function. Etanercept is approved with and without methotrexate for patients who have demonstrated an incomplete response to therapy with methotrexate and other disease-modifying anti-rheumatic drugs (DMARDs), as well as for first-line therapy in early RA, psoriatic arthritis, and juvenile RA. Adalimumab relieves the signs and symptoms of RA with and without methotrexate and other DMARDs, decreases total joint score progression, prevents joint erosions and joint-space narrowing in combination with methotrexate, and might improve physical function. When selecting a TNF antagonist, rheumatologists should weigh evidence and experience with specific agents before a decision is made for use in therapy. Rheumatoid arthritis (RA), a systemic disease, is the most common form of inflammatory arthritis . The disorder has a worldwide prevalence of about 1% and an annual incidence of 3 per 10,000 adults [2, 3]; it is more common in women than in men . RA is accompanied by significant morbidity and mortality. Depending on the severity of the disease at onset, the risk of disability can be as high as 33%, and mortality can be increased by as much as 52%, frequently as a result of infection or circulatory disease. As might be expected, patients with RA also have a significant impairment in their quality of life (QOL) . The ultimate goals of treatment are the prevention or control of joint damage, the prevention of functional loss, and the relief of pain . With the earlier and more aggressive use of disease-modifying anti-rheumatic drugs (DMARDs) and with the introduction of the tumor necrosis factor (TNF) antagonists during the past 5 years, the management of RA has changed markedly. Previously, treatment was organized in a therapeutic pyramid, in which conservative management with nonsteroidal anti-inflammatory drugs was administered for several years, followed by the addition of DMARDs in a slow and incremental fashion once radiographic evidence of bony erosions appeared . Unfortunately, this approach was associated with increased morbidity, lost productivity, decreased life expectancy, and increased healthcare costs. Today, treatment with DMARDs alone, or in combination, and with TNF biologic response modifiers is initiated early in patients with RA who are at an increased risk for progressive disease [1, 7, 8]. The 2001 World Health Organization Collaborating Centre consensus meeting on anti-cytokine therapy guidelines identified appropriate patients eligible for anti-cytokine therapy as patients with active RA who have failed an adequate course of DMARD therapy . In these guidelines, unacceptable disease activity was defined as five swollen joints plus an elevated acute-phase response such as an erythrocyte sedimentation rate (ESR) of more than 28 mm/h or a C-reactive protein (CRP) concentration of more than 20 mg/l, whereas adequate exposure was defined as a course of methotrexate at a dose of at least 20 mg/week for 3 months or a smaller dose if toxicity is a limiting factor . The international consensus guidelines have provided useful additional evidence-based recommendations [9, 10]. Infliximab (Remicade®; Centocor, Inc., Malvern, PA, USA), etanercept (Enbrel®; Immunex Corp, Seattle, WA, USA), and adalimumab (Humira™; Abbott Laboratories, Abbott Park, IL, USA) are designed to modulate the inflammatory cascade of RA by binding TNF, thereby decreasing its bioavailability. Various cytokines have been detected in the synovial fluid of patients with RA, both pro-inflammatory (namely TNF, interleukin-1 [IL-1], and IL-6) and anti-inflammatory (transforming growth factor-β and IL-10) . With several cytokines involved in the cytokine network of RA, it was argued that the suppression of only one mediator in a cytokine network might not be sufficient to control the pathophysiologic process underlying the disease . Early studies by Brennan and colleagues demonstrated that in a synovial cell culture system the secondary synthesis of IL-1 and other cytokines could be markedly reduced by targeting TNF [11, 12]. This led to more active research in this direction. In summary, the role of TNF is based on (1) its ability to degrade cartilage and bone in vitro, (2) its arthritogenic properties in animal models, (3) the co-localization of its receptors in RA synovium and the pannus-cartilage junction, and (4) its central role in regulating the synthesis of IL-1 in cultured RA-derived synovial cells [13, 14]. Infliximab, etanercept, and adalimumab have undergone extensive clinical trials that have shown them to be efficacious and safe. Although they share common properties as TNF biologic response modifiers, these agents possess distinct pharmacokinetic and pharmacodynamic profiles. In the absence of any directly comparative trials, this article seeks to place the various considerations of their efficacy in perspective. It focuses on how these agents have fared in terms of their effects on symptoms (assessed by American College of Rheumatology [ACR] response criteria), structure (based on erosion, joint-space narrowing, and Sharp scores), and physical function/QOL (based on standardized questionnaires such as the Health Assessment Questionnaire [HAQ]). Etanercept is a fusion protein consisting of the ligand-binding portion of the human p75 TNF receptor plus the Fc fragment of human IgG1 . Etanercept has a terminal half-life of 102 ± 30 hours . The recommended starting dose is 25 mg subcutaneously (s.c.) twice weekly, with or without methotrexate . In a multicenter, double-blind, placebo-controlled, phase II trial, 180 patients with refractory RA were randomized to one of four groups: etanercept 0.25, 2, or 16 mg/m2 s.c., or placebo twice weekly for 3 months . The primary efficacy measure was the percentage change in swollen joint count, tender joint count, and total count of swollen and tender joints from baseline to study end point (3 months) . The data were then analyzed to determine the number of patients who attained the ACR criteria for 20% improvement (ACR20) and 50% improvement (ACR50). ACR20 is defined as a 20% improvement in tender and swollen joint counts and at least three of the following disease activity variables: patient's assessment of pain, patient's global assessment of disease activity, physician's global assessment of disease activity, patient's assessment of physical function, and ESR or CRP concentration . Treatment with etanercept resulted in significant dose-related reductions in disease activity. After 3 months, improvements in ACR20 criteria were demonstrated in 75% of patients in the group with the highest dose (16 mg/m2), compared with 14% of controls (P < 0.001). Additionally, the mean percentage reduction in the number of tender or swollen joints was significantly greater in the etanercept 16 mg/m2 group than in the controls (61% versus 25%, P < 0.001). There were no significant safety issues. The authors concluded that monotherapy with etanercept for 3 months is safe, well tolerated, and associated with clinical improvement in the symptoms of RA. Moreland and colleagues evaluated the efficacy of 10 mg and 25 mg doses of etanercept by using the primary efficacy end points of improvements in disease activity as determined by ACR20 and ACR50 criteria at 3 and 6 months . This randomized, placebo-controlled trial involved 234 American and Canadian patients with active RA who had demonstrated an inadequate response to DMARD therapy. The number of patients who attained the ACR criteria for 70% improvement (ACR70) and changes in scores for swollen and tender joints were also assessed at the specified time intervals. Etanercept produced a significant dose-related improvement in disease manifestation. At 3 months, a significantly greater percentage of patients in the etanercept 25 mg group achieved ACR20 and ACR70 responses than did controls (62% versus 23%, P < 0.001 [ACR20], and 41% versus 8%, P < 0.001 [ACR50]) . At 6 months, a significantly greater percentage of patients who received etanercept 25 mg met the ACR20 and ACR50 criteria than did controls (59% versus 11%, P < 0.001 [ACR20] and 40% versus 5%, P < 0.001 [ACR50]) . Similarly, improvements in ACR20 and ACR50 scores were reported in a significantly greater percentage of patients who received etanercept 10 mg than controls (51% versus 11%, P < 0.001 [ACR20] and 24% versus 5%, P < 0.001 [ACR50]). Other 6-month results showed that mean counts of tender and swollen joints were significantly reduced in the patients who received etanercept 25 mg compared with controls (56% versus 6%, P < 0.05; 47% versus 7%, P < 0.05, respectively) . Finally, significantly more etanercept-treated patients achieved an ACR70 response than did controls. At 6 months, 15% of patients in the etanercept 25 mg group, 9% of patients in the etanercept 10 mg group, and 1% of patients in the placebo group had achieved ACR70 response (P < 0.031 for each etanercept group compared with the placebo group) . Etanercept was well tolerated, and the investigators concluded that etanercept monotherapy could safely provide rapid, significant, and sustained benefits in patients with active RA. The long-term efficacy and safety of etanercept monotherapy in patients with DMARD-refractory RA have also been demonstrated in open-label extension studies lasting up to 5 years [19, 20]. Patients from a previous long-term safety trial, in which etanercept monotherapy was investigated in adults who had not responded satisfactorily to at least one DMARD, have been followed for up to 4.3 years (median, 2.4 years) for a total of 1336 patient-years . Results are now available for 479 adult patients who received etanercept as monotherapy for more than 1 year, 420 patients who received the drug for more than 2 years, 164 patients who received the drug for more than 3 years, and 12 patients who received the drug for more than 4 years . Patients were evaluated by ACR criteria for disease activity. At 3.5 years, 69%, 50%, and 25% of patients had achieved ACR20, ACR50, and ACR70 responses, respectively . Moreland and colleagues reported their observations on the efficacy and safety of up to 5 years of etanercept therapy in patients with RA on the basis of the experience of participants in North American trials of etanercept who decided to enroll in open-label extension studies . Data on long-term efficacy were available from 159 patients who had been evaluated for more than 4 years. The results showed that 28% of these patients had no tender joints, 24% had no swollen joints, and 21% had HAQ disability scores of 0 units . Safety data, which were derived from 1442 patients who had been receiving etanercept for up to 5 years, showed an overall low rate of adverse events. The frequency of infections requiring hospitalization or intravenous antibiotics was 0.04 per patient-year in the total population (3573 patient-years), equivalent to the rate in placebo groups in controlled trials . The efficacy of etanercept in combination with methotrexate has been evaluated in randomized, double-blind, placebo-controlled, and open-label extension studies [21, 22]. Weinblatt and colleagues conducted a 6-month randomized, placebo-controlled, double-blind trial of etanercept 25 mg s.c. twice weekly plus methotrexate in 89 patients with persistently active RA despite at least 6 months of methotrexate therapy at a stable dosage of 10–25 mg/week . The primary efficacy measure was the percentage of patients who met ACR20 criteria at 24 weeks. Patients treated with the combination experienced rapid and sustained improvement. At 6 months, the ACR20 criteria were met by 71% of patients treated with the combination of etanercept and methotrexate but by only 27% of patients treated with methotrexate plus placebo (P < 0.001). Furthermore, the ACR50 criteria were met by 39% of the patients treated with etanercept plus methotrexate but by only 3% of the patients treated with methotrexate plus placebo (P < 0.001). The patients who received etanercept plus methotrexate had significantly better outcomes according to other measures of disease activity. At 24 weeks, the ACR70 response criteria were met by 15% of the group receiving etanercept plus methotrexate, versus 0% of the methotrexate plus placebo group (P = 0.03) . Also at 24 weeks, patients in the etanercept plus methotrexate group had median counts of tender joint of 7 versus 17 in the methotrexate plus placebo group; these were improvements from baseline of 75% and 39%, respectively, in which patients had a median of 28 tender joints. Further, those in the etanercept plus methotrexate group had a median count of 6 swollen joints versus 11 in the methotrexate plus placebo group; these were improvements from baseline of 78% and 33%, respectively, in which patients had a median of 18 swollen joints . For the HAQ data at 24 weeks, there was a 47% improvement (from median values of 1.5 units at baseline to 0.8 unit at the end of the study) in the etanercept plus methotrexate group, and there was a 27% improvement (from median values of 1.5 units at baseline to 1.1 units at the end of the study) in the methotrexate plus placebo group . Adverse events included mild injection-site reactions, which occurred significantly more often in the etanercept plus methotrexate group than in the methotrexate plus placebo group (42% versus 7%, P < 0.001) . Overall, infection (for example upper respiratory tract infections or sinusitis) was the most common adverse event, but there were no significant intergroup differences in incidence or type of infection . The benefits of etanercept plus methotrexate were further confirmed in a long-term trial that involved 79 of the 89 patients who had previously participated in the trial discussed earlier . Of the 79 patients who originally enrolled, 14 withdrew and 65 patients remained on therapy for a median of 44 months (maximum 47 months) . A reduction in the doses of methotrexate and steroids was allowed after patients had received at least 3 months of etanercept in addition to methotrexate. As permitted by the protocol, 62% of the 66 patients assessed at 3 years either reduced (from 17.5 mg/week at baseline to 11.0 mg/week, a 37% mean reduction; P < 0.0001) or discontinued their methotrexate dosage, with 29% of patients discontinuing methotrexate . Among the patients receiving steroids, 3-year data showed 83% of patients had a reduction (from baseline of 6.4 mg/day to 2.4 mg/day, a 63% mean reduction; P < 0.0001), with 56% of patients discontinuing steroids . There was sustained improvement of disease activity, based on ACR response criteria, in patients treated with etanercept even though methotrexate and steroid doses were reduced or their use was discontinued. Data from 57 patients evaluated for efficacy showed that 77%, 47%, and 23% of patients met ACR20, ACR50, and ACR70 criteria, respectively, after 3 years of therapy . These studies indicate that etanercept plus methotrexate produces clinically significant and long-term benefits in patients with persistently active RA. In addition to improving outcomes in patients with chronic RA, etanercept has been demonstrated to be of benefit in patients with early RA. In the Early Rheumatoid Arthritis trial, which consisted of a 1-year blinded phase (n = 632)  and a 1-year open-label extension phase (n = 512) , etanercept 10 or 25 mg s.c. twice weekly was compared with methotrexate (mean dosage 19 mg/week) in patients with active early RA (mean duration less than 3 years). ACR criteria were employed to assess treatment efficacy in terms of clinical response. The percentages of patients in the group assigned to receive etanercept 25 mg who had ACR20, ACR50, and ACR70 responses were significantly greater than those in the methotrexate group at most evaluations within the first 6 months (P < 0.05) but were approximately the same thereafter . At 12 months, 72% of the patients in the group assigned to receive etanercept 25 mg had an ACR20 response, as compared with 65% of patients in the methotrexate group (P = 0.16) . In the same trial, investigators compared the effects of etanercept and methotrexate on radiographic evidence of disease progression. Bone erosion and joint-space narrowing were measured radiographically and scored with the Sharp scale, in which an increase of 1 unit represents one new erosion or minimal narrowing [23–27]. The Sharp score is the sum of the erosion scores (based on a six-point scale of 0 to 5 at 46 joints) and joint-space narrowing scores (based on a five-point scale of 0 to 4 at 42 joints). In this trial the Sharp score ranged from 0 (no damage) to 398 (severe joint destruction) [23, 25–27]. The 12-month data from the blinded phase showed less radiographic evidence of bone erosion in the etanercept 25 mg group than in the methotrexate group (the mean increase in erosion score was 0.47 versus 1.03 units, P = 0.002) . There were no significant differences between the groups in progression of joint-space narrowing . 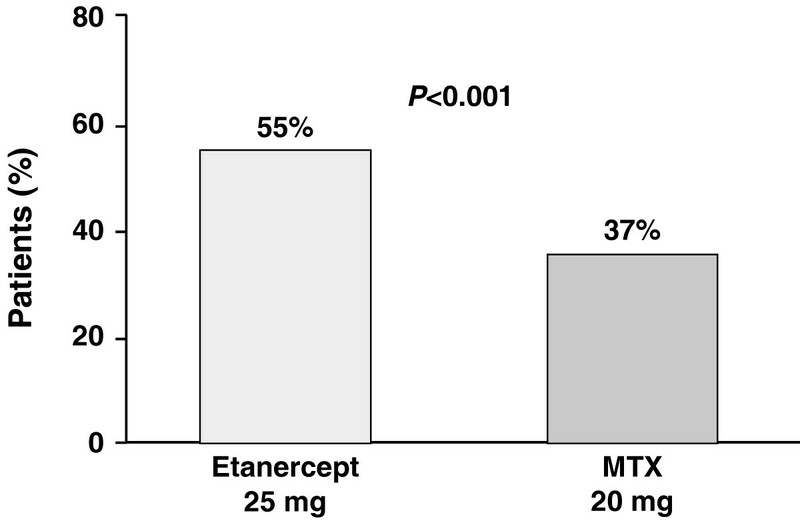 Patients in the etanercept 25 mg group had mean Sharp scores of 12.4 ± 15.8, whereas patients in the methotrexate group had mean Sharp scores of 12.9 ± 13.8 [23, 24]. At 6 months the mean total Sharp scores increased by 0.57 unit in the etanercept 25 mg group and by 1.06 units in the methotrexate group (P = 0.001). At 12 months, mean total Sharp scores increased by 1.00 unit in the etanercept 25 mg group and by 1.59 units in the methotrexate group (P = 0.11) . Data from the open-label phase showed that, at 24 months, etanercept was more effective than methotrexate in arresting structural damage on the basis of mean increases in total Sharp scores (1.3 versus 3.2 units, P = 0.001) and erosion scores (0.7 versus 1.9 units, P = 0.001) . Effects of etanercept and methotrexate on joint-space narrowing at the end of 24 months were comparable (Fig. 1) [24, 28]. 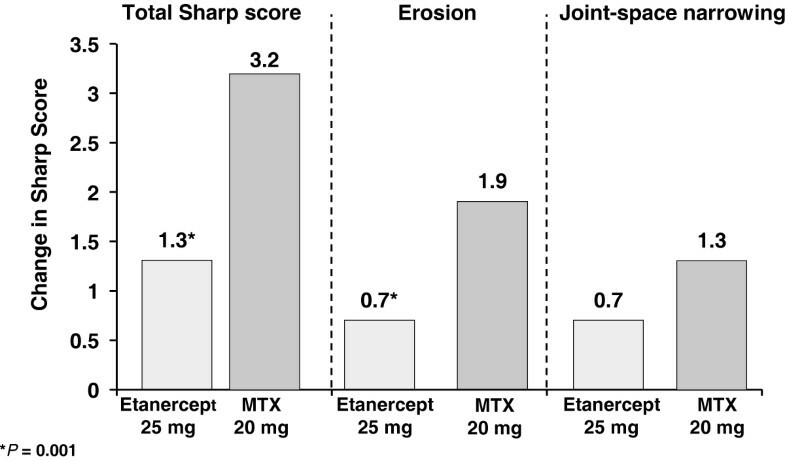 Changes in total Sharp score, erosion, and joint-space narrowing at 2 years in patients who had early rheumatoid arthritis (RA) and were given etanercept or methotrexate (MTX). These were the data from the open-label extension phase of the Early Rheumatoid Arthritis trial . In terms of physical function, a similar percentage of patients in the etanercept and methotrexate groups (about 55%) demonstrated an improvement in HAQ score of at least 0.5 unit at 1 year. The same proportion of etanercept-treated patients (55%) but a lower percentage of methotrexate-treated patients (37%) maintained improvement for up to 2 years (P < 0.001) (Fig. 2) . As a point of reference, a change in HAQ score must equal at least 0.22 unit to be considered clinically significant . Another study showing that etanercept led to a sustained improvement in disease activity, as determined by reduction in HAQ scores, was conducted by Fleischmann and colleagues . In this analysis, improvements in HAQ disability scores over 2 years were compared between 207 patients with early RA (mean duration 1 year) and 563 patients with long-standing (late) RA (mean duration 12 years), who were treated with etanercept 25 mg s.c. twice weekly . Mean baseline patient characteristics for the early RA and late RA groups were similar, including age (51 versus 53 years), HAQ (1.5 versus 1.6 units), tender joint count (31 versus 32), swollen joint count (24 versus 26), CRP concentration (3.3 versus 4.4 mg/dl), and presence of rheumatoid factor (87% versus 81%); those with early disease had been treated with fewer DMARDs (0.5 versus 3.3) . Results at 2 years showed that mean HAQ scores declined in both the early RA (from 1.5 to 0.6 unit) and late RA (from 1.6 to 1.0 unit) groups. A greater percentage of patients with early disease achieved HAQ scores of 0 units, compared with those who had late disease (29% versus 14%, P < 0.001) . The study concluded that aggressive therapy has a greater potential to improve disability, as measured by HAQ, in patients with early RA than in patients with more established or late RA who have not responded satisfactorily to multiple DMARDs . Adalimumab, also known as D2E7, is a fully human recombinant IgG1 anti-TNF monoclonal antibody . Adalimumab is available as a preparation that is administered s.c. every 2 weeks . Studies indicate that adalimumab is effective and safe as biologic therapy for patients with RA, with and without methotrexate or in combination with other DMARDs. Van de Putte and colleagues studied the efficacy and safety of adalimumab in a phase III, placebo-controlled, double-blind, 26-week trial involving 544 patients with RA who had failed treatment with one or more DMARDs . After a DMARD washout period of 4 weeks, patients were randomized to one of five groups: adalimumab 20 or 40 mg s.c. weekly or biweekly, or placebo. Baseline demographics were similar for all groups. Treatment with adalimumab produced dose-related and schedule-related disease improvements measured by ACR20, ACR50, and ACR70 response criteria, with the monoclonal antibody demonstrating superiority to placebo at all dosages (Fig. 3) . Adalimumab was safe and well tolerated, with the most common adverse events being injection-site reactions (9.7%), rash (9.4%), and headache (9.4%) . Increases in ACR20, ACR50, and ACR70 scores in patients with rheumatoid arthritis who failed previous disease-modifying antirheumatic drug therapy and were given one of four dosages of adalimumab or placebo. Adapted with permission from the BMJ Publishing Group . Adalimumab plus methotrexate has been shown to be efficacious in patients who demonstrated a partial response to methotrexate alone. The Anti-TNF Research Study Program of the Monoclonal Antibody D2E7 in Patients With RA (ARMADA) study was a 24-week, randomized, double-blind, placebo-controlled, dose-ranging trial in which 271 patients with RA were administered adalimumab 20, 40, or 80 mg s.c. every 2 weeks plus methotrexate (mean dosage 16.8 mg/week) or placebo [33, 34]. Efficacy measures included the proportion of patients who attained an ACR20 response at 24 weeks (primary end point) as well as the proportion of those who met ACR50 and ACR70 response criteria at the end of the study . An ACR20 response at 24 weeks was attained by a significantly greater percentage of patients in the 20, 40, and 80 mg adalimumab plus methotrexate groups (47.8%, 67.2%, and 65.8%, respectively) than in the placebo plus methotrexate group (14.5%) (P < 0.001) . 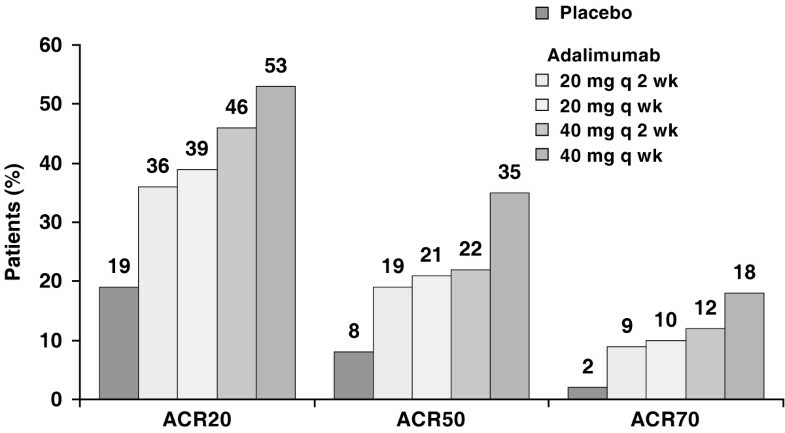 ACR50 response rates were attained by a significantly greater percentage of patients in the 20, 40, and 80 mg adalimumab groups (31.9%, 55.2%, and 42.5%, respectively) than in the placebo group (8.1%) (P = 0.003, P < 0.001, P < 0.001, respectively) . ACR 70 response rates were attained by a significantly greater percentage of patients in the 40 and 80 mg adalimumab groups (26.9% and 19.2%, respectively) than in the placebo group (4.8%) (P < 0.001 and P < 0.02) . There were also clinically significant improvements in HAQ and physical function, where the baseline scores for the 20, 40, 80 mg, and placebo groups were 1.52, 1.55, 1.55, and 1.64 units, respectively . 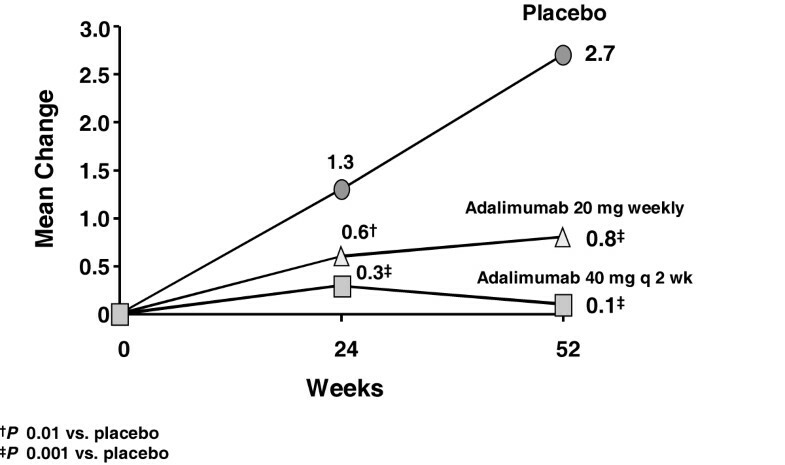 At 24 weeks, the HAQ data showed mean reductions in scores of 0.54, 0.62, and 0.59 unit for the adalimumab 20, 40, and 80 mg groups, respectively, compared with 0.27 for the placebo group (P = 0.004, P < 0.001, P < 0.001, respectively) . After completing the 6-month (24-week) double-blind portion of the ARMADA trial, 250 of the original 271 patients entered an open-label extension study that evaluated the efficacy and safety of the combination of adalimumab and methotrexate over 12 months . All patients received adalimumab 40 mg s.c. every other week in combination with methotrexate; 231 of the 250 patients completed 12 months of treatment . Mean baseline patient characteristics were as follows: age, 55.1 years; gender, 75.6% female; positivity for rheumatoid factor, 81%; duration of RA, 12.5 years; number of previous DMARDs used, 3; and methotrexate dosage, 16.8 mg/week . Results showed that when adalimumab was given to partial responders to methotrexate, clinical efficacy was sustained throughout 12 months . At 12 months, the ACR20, ACR50, and ACR70 response rates for the adalimumab 40 mg group were 71.2%, 50.8%, and 26.0%, respectively . With regard to QOL data at 12 months, the adalimumab 40 mg group showed a decline of 0.6 unit from baseline, which indicates that the initial response was maintained for the entire 12 months [34, 35]. In a 52-week, double-blind, placebo-controlled trial involving 619 patients with active RA, treatment with adalimumab was shown to inhibit the progression of structural joint damage in patients with active RA who had an incomplete response to methotrexate therapy . Patients were randomized to receive adalimumab s.c. 40 mg biweekly or 20 mg weekly, or placebo. Treatment with methotrexate (mean baseline dosage 16.6 mg/week) was initiated and continued with no change in dose over the course of the study. After 1 year there was a significant response in clinical measures of disease activity in the adalimumab-treated patients and significant differences in radiographic end points between the adalimumab-treated and placebo groups. Mean increases in the Sharp score for the adalimumab 20 and 40 mg and placebo groups were 0.8, 0.1, and 2.7, respectively (P ≤ 0.001 versus placebo) (Fig. 4) . There was a significant decrease in both joint erosions and joint-space narrowing. 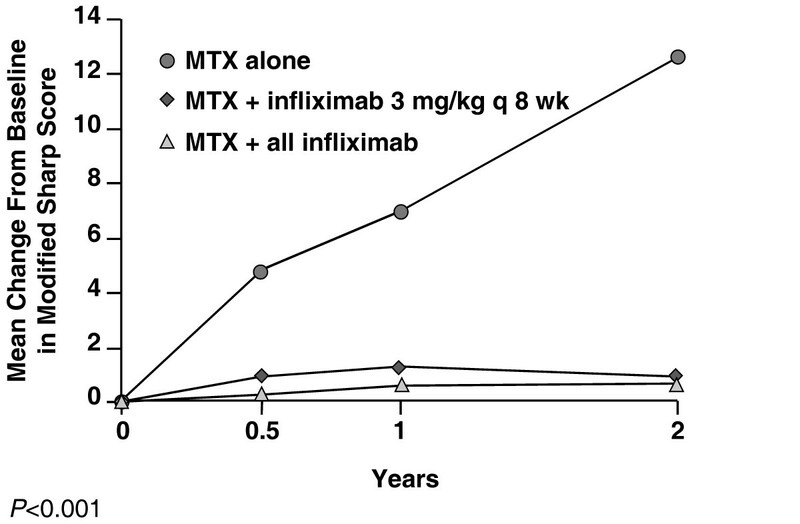 Thus, compared with methotrexate alone, treatment with adalimumab plus methotrexate inhibits the progression of structural joint disease in patients with RA. Adalimumab has been shown to be efficacious in patients who have failed previous DMARD therapy or have demonstrated incomplete responses to a variety of DMARDs, including methotrexate. In addition, adalimumab has been shown to inhibit radiographically evident disease progression. In each of these studies there was a significant improvement in physical function and QOL in patients for up to 1 year. Because the US Food and Drug Administration (FDA) requires at least 2 years of data showing improvement, adalimumab has not yet been approved for this indication [35, 36]. Infliximab is a chimeric IgG1-κ monoclonal antibody against TNF produced by recombinant DNA technology in a continuously perfused cell line . Unlike etanercept, infliximab does not bind lymphotoxin-α : it binds both the monomeric and trimeric forms of the inflammatory cytokine TNF, forming a stable molecular complex with both molecular species. Infliximab must be administered by intravenous infusion and has a terminal half-life of 8–10 days. In managing patients with RA, the recommended dose of infliximab is 3 mg/kg initially, followed by similar doses at weeks 2 and 6, then every 8 weeks thereafter. This regimen can be adjusted by increasing the dose to 10 mg/kg and/or shortening the intervals between doses to as often as every 4 weeks to optimize patient response . As of February 2002, infliximab has been administered to more than 271,000 patients (data on file, Centocor, Inc.). Infliximab in combination with methotrexate is the only regimen so far approved by the FDA for reducing symptoms, inhibiting structural damage, and improving physical function in patients with moderate-to-severe RA . The efficacy and safety of infliximab in patients with RA has been demonstrated in the Anti-TNF Trial in RA With Concomitant Therapy (ATTRACT) study [39–41] and several earlier studies [42–46]. ATTRACT was a 2-year, multicenter, multinational trial of 428 patients with active RA despite methotrexate therapy. The patients were randomized to one of five regimens: infliximab 3 or 10 mg/kg intravenously every 4 or 8 weeks, or placebo . All patients continued to receive a stable dose of methotrexate (median 15 mg/week for at least 6 months; range 10–35 mg/week). At 30 weeks, 50% of patients who received infliximab 3 mg/kg every 8 weeks met the ACR20 response criteria, compared with 20% of placebo recipients (P < 0.001) . At 54 weeks, a greater percentage of patients who received infliximab 3 mg/kg every 8 weeks met ACR20, ACR50, and ACR70 response criteria than controls (42% versus 17%, P < 0.001 [ACR20]; 21% versus 8%, P = 0.027 [ACR50]; and 10% versus 2%, P = 0.04 [ACR70]) . These improvements in the inflix-imab-treated patients, compared with the controls, were sustained for up to 102 weeks (42% versus 16%, P < 0.001 [ACR20]; 21% versus 6%, P = 0.003 [ACR50]; and 10% versus 1%, P = 0.008, respectively [ACR70]) . Patients who received the infliximab 10 mg/kg regimens also showed superior improvement in ACR20, ACR50, and ACR70 response, compared with controls, for up to 102 weeks . Results from the ATTRACT study indicated that infliximab halts the progression of structural joint disease and can even improve some radiographic parameters. At 54 weeks, patients treated with methotrexate plus placebo demonstrated evidence of increased joint damage, with a mean change in total Sharp score of 7 units . This finding is consistent with that of other studies of structural joint damage in patients receiving DMARDs. However, patients treated with infliximab showed no evidence of progressive joint damage and had a mean change in total Sharp score of 0.6 unit by 54 weeks (P < 0.001) . The durability of this benefit was confirmed in the 102-week ATTRACT data (Fig. 5) [39–41]. Changes in modified Sharp score in patients with active rheumatoid arthritis despite methotrexate (MTX) therapy who were given MTX alone or in combination with infliximab (the Anti-Tumor Necrosis Factor Trial in Rheumatoid Arthritis With Concomitant Therapy [ATTRACT] study) [39–41]. Two-year follow-up data from the ATTRACT study showed that infliximab inhibits structural damage in RA patients with moderately-to-severely active disease as assessed by the Sharp score, bone erosion scores, and joint-space narrowing scores [39–41]. In ATTRACT, all regimens (doses/schedules) of infliximab plus methotrexate showed significantly greater improvement from baseline in HAQ and the Medical Outcomes Study Short Form Health Survey (SF-36) physical component summary score averaged over time through week 54 compared with placebo plus methotrexate [37, 40]. In terms of the median (interquartile range) improvement from baseline through week 54 in HAQ, was 0.4 (0.1, 0.9) for the infliximab groups compared with 0.1 (-0.1, 0.5) for the placebo plus methotrexate group . The favorable effects on HAQ and SF-36 were sustained through week 102 ; all infliximab-treated patients at that time showed a median improvement in HAQ of 0.3 versus 0.1 for placebo treated patients, P < 0.001 . RA causes significant functional morbidity accompanied by pain, suffering, and an impaired QOL . The TNF antagonists represent a significant advance in the therapy of active RA. The three members of this class – infliximab, etanercept, and adalimumab – have shown efficacy in inhibiting joint destruction over various lengths of time, reducing symptoms, and improving physical function in patients with RA. However, they have distinct clinical, pharmacokinetic, and pharmacodynamic properties that must be considered when selecting a drug for therapy. An integral component of the decision-making process regarding choice of therapy is patient preference. Other factors include published evidence documenting the overall experience with each drug, the duration of each trial in which the drugs were studied, the type of statistical analysis employed, and patient factors such as disease duration, disease severity at baseline, and the use of previous and concomitant medications. Careful consideration of all these clinical variables and appropriate use of the newer additions to the antirheumatic armamentarium such as the TNF biologic response modifiers will, it is hoped, contribute to better outcomes for patients with RA. SS is a speaker for Centocor, Abbott and Boehringer. RF is a consultant, on the Speaker's Bureau, and performed clinical studies for Centocor, Immunex, Amgen, Wyeth and Abbott. GJM is a consultant for Centocor, and on the Speaker's Bureau for Abbott and Centocor.